Getting kids to exercise can be a challenge. Kids would rather play a video game or watch TV. And, in an age of youth sports specialization, where elite status in a sport can be determined by fourth grade, a lot of kids are left off organized teams. So they retreat to the computer or couch, and sedentary habits begin. This issue is only made worse by the fact that many elementary schools have cut back on gym classes in recent years. In June 2005, researchers from the US and Canada published a review of over 850 studies on exercise and kids. Their conclusion was that "school-aged" youth should obtain 60 minutes of moderate to vigorous physical activity every day (Strong WB, et al. 2005). In the UK, the Health Education Authority adopted the recommendation of "60 minutes per day of moderate intensity exercise" in 1998. However, in July 2006, European researchers stated in a paper published in The Lancet that, to minimize the risk of cardiovascular disease, children need more than 1 hour of exercise per day. To prevent insulin resistance, children may need as much as 90 minutes of exercise per day (Andersen LB, et al. 2006). Unfortunately, most children in both the US (Pate RR, et al. 2006) and in the UK (Riddoch CJ, et al. 2007) don't meet those goals. At first, some may think that using technology to motivate kids to exercise is sort of like feeding whiskey to an alcoholic in hopes that it will cure his alcoholism. After all, television and video games are now regarded as one of the reasons why kids are so sedentary. • www.KidNetic.com is a web site for kids. It was launched way back in June 2002 by the International Food Information Council in partnership with several other groups interested in youth health and fitness. The web site provides some educational games that cover nutrition and exercise. We list several more web sites like this on our Links page. However, it's anybody's guess whether these web sites achieve any meaningful results. Still, there is reason for optimism when it comes to utilizing technology to motivate kids to exercise. During the past 2 decades, some really clever and "cool" exercise games have been developed. It's quite possible that "exergames" and "interactive fitness" can mobilize couch-prone video-game players. WHAT'S THE DIFFERENCE BETWEEN "EXERGAMING" AND "INTERACTIVE FITNESS"? 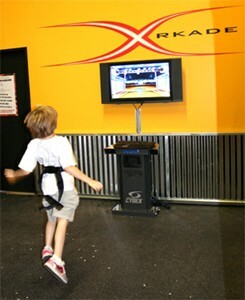 According to Lisa Witherspoon, PhD, at the University of South Florida's School of Physical Education, and co-director of the university's interactive fitness research lab, " 'exergaming' represents activities that utilize a computer screen. 'Interactive fitness' activities are technology-driven games that don't require a computer screen." You'll also see the label "active video games" used. However, because some of these games don't utilize a video screen, we'll stick with Dr. Witherspoon's names. The evolution of exergaming began in the 1980s, with companies developing high-end fitness equipment that was primarily used by professional sports teams. Health clubs were reluctant to install the equipment. It was usually bulky and not user-friendly, and the average consumer couldn't afford it. One of the earliest exergames was Konami's Dance Dance Revolution (DDR), which was first introduced to Japanese video arcades in 1998. Players move their feet forward, back, and side to side on a raised platform while following cues on a video screen. It became so popular in Norway they registered the game as a national sport. As technology improved, costs dropped and exergaming moved from the arcade to the gym and the living room. More recently, the exergaming industry has focused on the youth market, making it a viable option for getting kids to exercise. • Dance Dance Revolution, DDR, stepping game (by Konami; www.Konami.com): It requires stepping on specific areas of a mat (dance pad) that looks like a tic-tac-toe grid. The dancer must step in 4 directions, depending on the arrow on the screen. It's kind of like Tom Hanks jumping on that piano keyboard in the movie "Big"! • Trazer® (by Traq 3D Fitness, www.Trazer.com): This thing is very cool! (see picture to the right of young boy jumping). The exerciser wears a waist belt that contains an infrared beacon and, reacting to the images on the computer monitor, must move in specific directions. Kids love it. But don't underestimate its fitness training potential. The Trazer® develops reaction time, speed, power, and balance. It is also useful for basketball players, hockey and soccer goalies, tennis players, martial artists, etc., who want to improve their reaction skills. Several professional sports teams have used it. The company's advisory group includes orthopedic surgeons, athletic trainers, and sports medicine professionals. • Core Muscle Trainer (by Panasonic; www2.Panasonic.com): This thing looks just like a horse saddle; it even has stirrups! The unit moves in all 3 planes while you sit on it, forcing you to engage your core muscles to keep from falling off. The movements are very subtle, but noticeable. Urban cowboys (and cowgirls!) will love this one. • LightSpace Play lighted floor game (by The Active Gaming Company; www.The-AGC.com): This game is also very cool. It can be set up so that players have to avoid stepping on the light (virtual dodgeball), or, where the goal is to intentionally step on the light in order to score points. Lightspace® Play includes an interactive floor surface comprised of 16”x16” programmable LED lit and pressure sensitive tiles constructed to fit a 10 foot square space. Each tile consists of sixteen 4” x 4” pixels that can display any color, pattern or image. The surface is able to detect location, movement and density of players to give a realistic gaming experience. Reactions to player movements are displayed on the surface and are accompanied by sound effects. • NEOS game wall (by Playworld Systems; www.PlayNEOS.com). Launched in October 2007, NEOS is a wall of 4 vertical panels, each with 4 large buttons. The buttons light up in red or green, in random order, and the players have to touch them before the light goes off. This requires a lot of rapid back-and-forth and up-and-down movements. It's very aerobic. 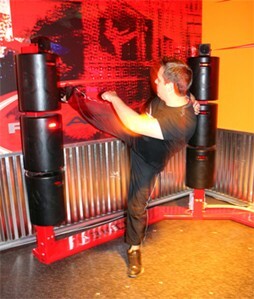 • 3-Kick punching and kicking station (by Fit Interactive; www.FitInteractive.com): This is a punching and kicking game. (see picture to the right) There are 3 padded columns similar to punching bags. The player must strike each pad within 5 seconds as they light up randomly. Very cool! • Wii virtual reality video system (by Nintendo; Wii.com): When Nintendo released Wii Fitness in 2006, it really attracted a lot of attention. And, pretty quickly, research began appearing regarding the ability of this system to improve fitness. 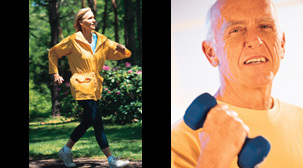 Further, it was found to be a useful low-impact form of exercise for elderly people. Today, Nintendo offers options from tennis to baseball to Zumba. • Sony's "Kinetic" video game system: This operates on their PlayStation system and utilizes their "EyeToy" USB camera. Quite a few research studies have employed this system. • Kinect for X-Box 360 (by Microsoft; www.XBox.com): Microsoft's X-Box system now offers hundreds of video games to play. Some of those are "active" games featured in their "Fitness" series. These operate on their XBOX 360 system and uses their Kinect sensor (camera)One example is a video game endorsed by celebrity fitness trainer Jillian Michaels: "Jillian Michaels Fitness Ultimatum 2012." "The key element in motivating kids to exercise," says USF's Witherspoon, "is to make exercise fun. As soon as kids learn that the purpose of a game is to promote exercise, they're not as interested." I agree with Dr. Witherspoon. I think the "fun factor" is the most critical element in getting, and keeping, kids motivated to exercise. I also think that putting kids through a series of Nautilus-like exercise machines, even if supervised by a personal trainer, is ludicrous. In my opinion, this is a sure-fire formula for "burn-out." Remember the abrupt exit Andrea Yeager had from professional tennis while still a teenager? Some readers may feel this isn't a relevant example, but I think it is. When a child is pushed to do something repeatedly for years and years, especially if it isn't fun, often, there is a revolt. 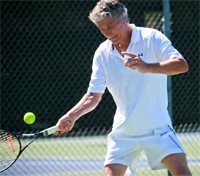 At least tennis has a competitive element to it; working out on weight-machines doesn't have that. DOES EXERGAMING AND INTERACTIVE FITNESS WORK? So, do these exercise games produce results? There's no doubt, some of these games are pretty cool. Even I'll admit, I'd like to have one of those "3 Kick" punching/kicking stations! In a study published in the Archives of Pediatrics and Adolescent Medicine, researchers from SUNY reported that "personal fulfillment" was the strongest motivating factor for physical activity for adolescents (Haverly K, et al. 2005). This would seem to support the "fun factor" as being relevant. In an extensive review of the literature, researchers at the University of Minnesota found that playing active video games is definitely preferred over sedentary activities like watching TV, however, they are only mildly preferred over traditional play and activity (Gao Z, et al. 2015). While some researchers are evaluating specific exercise games, at USF's lab in Tampa, Witherspoon is focusing on how kids behave when they have an entire room of these exercise games to play with. So far, she has seen a very positive impact. In one study there, 5th-graders were observed while playing in the arcade. They were told they could sit down if they were tired or just bored. "I did not have one student take this option," said Dr. Witherspoon. "All remained active. In addition, we saw an improvement in self-esteem in many, too." In some studies, the amount of energy expenditure doubled (Smallwood SR, et al. 2012) or tripled (Biddiss E, et al. 2010) compared to just sitting around playing traditional video games. Researchers at the University of Oklahoma documented a 2-fold increase in energy expenditure when kids ages 10-13 yrs played Wii Bowling and beginner-level Dance Dance Revolution (DDR). When they played Wii Boxing or level-2 DDR, their energy expenditure was higher, equivalent to walking at 3 miles per hour (Graf DL, et al. 2009). A study in adults ages 25-44 yrs revealed that Wii Fit Plus and Wii Sports generated exercise intensity levels of "light" to "moderate" (Miyachi M, et al. 2010). Are those values good enough to maintain and/or promote health? Researchers from Georgetown University analyzed 27 studies and concluded that the majority of active video games tested did promote activity that met the American College of Sports Medicine's recommendation of "moderate" intensity (Sween J, et al. 2014). When exercise heart rates are measured, it has been found that, in some cases, these exercise games are very aerobic. Researchers at Cal State in San Bernardino evaluated young adults during a 30-min session of playing either 3-Kick, Jackie Chan's Studio Fitness Power Boxing, or Disney's Cars Piston Cup Race. They found that the average exercise heart rate attained was 163 beats per minute (Siegel SR, et al. 2009). That's pretty impressive, and, it meets the target suggested by the American College of Sports Medicine. "We have found that some of these games push exercise heart rates all the way up into the 180-190-range. Cybex's 'Trazer' agility game produced the highest measurements," according to Dr. Witherspoon. • Can They Improve Health Parameters? Certainly, boosting energy expenditure and heart rate would seem to be a good thing. But, while evaluating only a single exercise session can provide insight on the physiologic response, studies of long-term use are better for assessing their impact on health parameters. • Canadian researchers conducted a study comparing exercise on a stationary bike that incorporated an interactive video (eg., GameBike with Sony PlayStation 2 video games) to exercise on a bike without any interactive video. The PlayStation 2 exercise videos included Smuggler's Run, ATV Offroad Fury, Gran Turismo 3, NASCAR Heat, and Need For Speed. Fourteen young men (ages 18-25 yrs) were studied. They exercised for 30 min/day, 3 days/week, for 6 weeks. At the end of the study, the group that exercised while viewing the exercise videos had a greater improvement in aerobic fitness (VO2max) and a lower resting blood pressure. However, these health and fitness improvements were attributed to the fact that this group had better attendance (exercised more often) than those who had access to only a regular exercise bike. Thus, this study suggests that exercising while watching these videos is effective mostly because it motivates users to exercise more regularly. There were no differences in body composition between the 2 groups at the end of the study (Warburton D, et al. 2007). • A study conducted in New Zealand revealed that kids ages 10-14 who used Sony's PlayStation EyeToy camera and several Sony active video games (eg., Play3, Kinetic, Sport, Dance Factory) regularly for 24 weeks had roughly 1 kg less weight gain compared to the control group (Maddison R, et al. 2011). • Researchers at West Virginia University assessed various health parameters in overweight children (average age 10.2 yrs) after playing Dance Dance Revolution for 12 weeks. They measured significant improvements in blood pressure, arterial blood flow, and aerobic capacity. Children who played DDR gained only 0.9 kg compared to 2.4 kg in the group that didn't (Murphy EC, et al. 2009). • Will Kids Play Them Regularly? So, yes, these techno-exercise games do boost heart rate and calorie expenditure, and, they do have the potential for improving health. But, the most important issue is this: users have to want to play them regularly because consistent activity is necessary to improve most health parameters. Think about it: do you see your kids playing Dance Dance Revolution (DDR) every single day, or, yourself playing Nintendo's Wii tennis every week year after year after year? Researchers at Baylor College of Medicine gave kids 9-12 years of age Wii controllers and 2 video games: one group got traditional sedentary video games (eg., Madden NFL 10, Super Mario Galaxy, and others) and the other group got active video games (eg., DDR-Hottest Party 3, Wii Fit Plus, and others). They provided no instructions. Instead they wanted to observe how much spontaneous use occurred with these active video games over a period of 12 weeks. They found that the kids receiving the active video games were not any more active than the group of kids receiving the traditional video games (Baranowski T, et al. 2012). In probably the most thorough analysis of the impact of active video games on children's health, researchers from Canada, the UK, and New Zealand reviewed 52 research papers published between 2006-2012. Eleven of these studies assessed regular usage. These 11 studies evaluated usage for 10 to 12 weeks. The results were variable, but, the authors of this review found that, while these exercise games did promote more activity, usage seemed to decline over time. They concluded that these exercise games did not induce enough activity to meet the desired 60 minutes per day goal on a daily basis (LeBlanc AG, et al. 2013). 1) How long will kids play these games? Some research shows that usage declines over a period of months. At some point, maybe kids just get tired of playing the same exercise game over and over? 2) What if playing these games takes the place of regular outdoor play? There's no question that these techno exercise games do motivate sedentary kids to exercise more (Gao Z, et al. 2015). But, what if kids decide to play their video boxing game and stop playing basketball or tennis or soccer? Or, just stop riding their bike? In this scenario, the total amount of weekly activity they get might actually decrease. 3) What are the health benefits of these games? At the end of the day, what matters is achieving and maintaining optimum health. If kids stop playing these games after a couple months, or, even if they play them regularly but their total amount of weekly exercise and physical activity decreases because they no longer play outside like they used to, then, these techno-games have backfired. 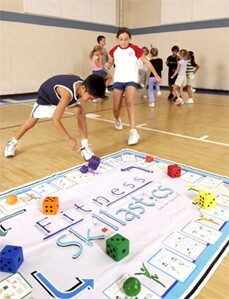 • Skillastics™ (www.Skillastics.com) is a good example of a low-tech exercise game. Designed by Sandy "Spin" Slade, a former college basketball player, Skillastics™ is like the board game Monopoly, except that each square presents a specific exercise drill that each member of the team must do. Skillastics™ games are available for 11 different fitness-related activities including basketball, soccer, generalized fitness, and others. It's a great concept because it is so simple. It works because it is fun for kids to play. According to their web site, the average heart rate of kids while playing Skillastics was 142 beats per minute. Sandy launched Skillastics™ in 2003. Since then, over 20,000 schools and community-based organizations in the US have purchased a Skillastics game. These customers include YMCAs, Boys and Girls Clubs, and Parks and Recreation Departments. She estimates that over 3 million kids have played Skillastics™. • What about a simple organized running program? One program like this that stimulates fitness in kids is Girls On The Run International (GOTRI, www.GirlsOnTheRun.org), a running program developed by Molly Barker, a four-time Hawaii Ironman triathlete. This nonprofit program encourages girls in grades 3-8 to exercise, building self-esteem in the process. The girls meet twice per week with a female coach for 12 weeks. At the end of the session, they participate in a 5-K. Launched in 1996, Girls On The Run has reached over 50,000 young girls in more than 150 cities in the US and Canada. And even a book might get your kids exercising more. 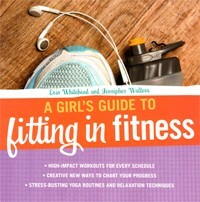 Here's one for girls we really like: "A Girl's Guide To Fitting In Fitness" by Erin Whitehead and Jennipher Walters. It's absolutely critical that we get children to play (exercise) more. As kids move into adolescence, their rates of regular (daily) exercise drop dramatically, especially in black girls (Kimm SYS, et al. 2002). There is evidence that once a child becomes obese, the struggles with weight-control may persist for life. The development of obesity during adolescence, in turn, is associated with higher rates of diabetes, heart disease, and metabolic syndrome (Daniels SR, et al. 2005; Morrison JA, et al. 2005). And if that is not scary enough, there is this quote from David Katz, MD at Yale: "Children today may be the first generation in history to experience a lifespan shorter than their parents." Hopefully, some of these new interactive exercise games will prevent that from ever happening. Exergame Fitness (www.ExergameFitness.com) is the global leader in exergaming products. Not only are they the largest distributor of exergames, but they also provide free grant assistance, layout design, and exergame education workshops. 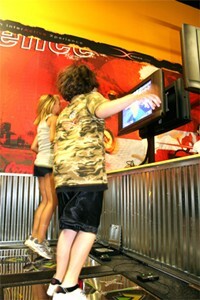 MultiSensory Fitness, Inc. (MultiSensoryFitness.com) sells a variety of interactive game walls called SMARTFit®. NOTE: "Kinetic" is the name of an active video game produced by Sony for their PlayStation 2 system. It requires the use of their "EyeToy" USB camera. "Kinect" is the name of a series of active video games produced by Microsoft for their XBOX 360 system. "Kinect Sensor" is the name of their camera that is required to play these games. DISCLOSURE: Neither the author, nor AthleteInMe, LLC, has any financial or business relationships with any of the products or companies mentioned in this review. Lisa Witherspoon, PhD, is an editorial advisor for AthleteInMe.com® and an advisor for The Active Gaming Company.